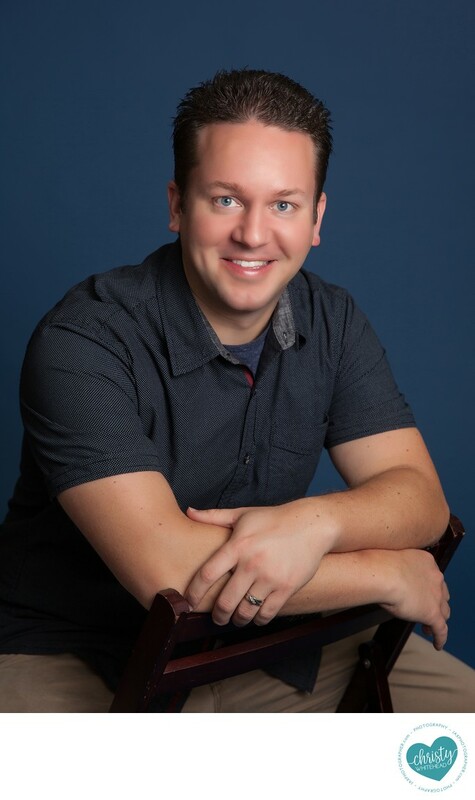 I recently did headshots for The Veil Wedding Photography, this is Landon Raulerson, owner and main photographer. He recently came into the studio for some updated headshots and to do a bit of networking for his business. Their style is very light and airy. I love their consistent editing and awesome work. I started off with some portraits of him and his wife (who works the business with him and also recently started The Veil Wedding Planning) on white, bone (off white) as well as outdoors, as that matches how they shoot more. But I also love doing something a little more dark and moody. I love a one light set up in the studio. It casts a bit of a shadow. It's really a nice look. He had on a dark blue shirt. And blue is great for skin tones, so I pulled out the blue backdrop to shoot him. Love how it turned out.